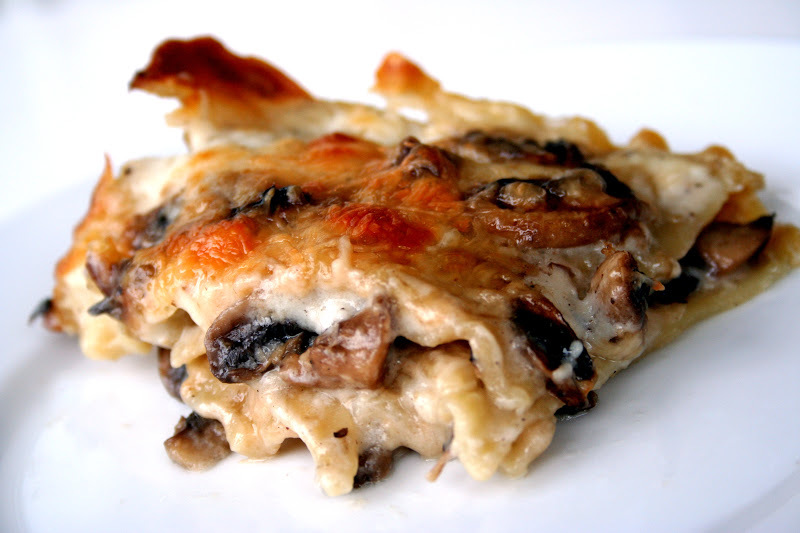 First of all, if you're not a fan of mushrooms you'll probably hate this lasagna because well, it's LOADED with them. I however, LOVE them. Especially cooked in a little butter and browned to perfection. Yum. This was a major hit at my house with all the creamy layers of alfredo, parmesan and browned mushrooms. And while I'm not usually a fan of nutmeg, it was amazing paired with the mushrooms. Who knew? Please give this a try if you even sorta like mushrooms even just a little bit because it is so tasty! *Note: If you don’t care to use no-boil noodles or don’t have them on hand, substitute regular lasagna noodles, boiling and draining them prior to assembling the lasagna. 2. For the white sauce, bring the milk and garlic to a simmer in a medium saucepan, or heat it in your microwave in a glass liquid measure, and set it aside. 3. In a large saucepan, melt 1/2 cup (8 tablespoons or 1 stick) butter. Add the flour and cook for one minute over low heat, stirring constantly with a whisk or wooden spoon. 4. Pour in the hot milk, a little at a time at first and whisking until combined. Once you’ve added half of it, you can add the second half all at once, along with 1 1/2 teaspoons table salt, the pepper, and nutmeg. Cook the white sauce over medium-low heat, stirring or whisking frequently, anywhere from 3 to 10 minutes, or until thick. Set aside. 5. To prepare the mushrooms, slice the mushrooms 1/4-inch thick, trimming stems if desired (I left them on). In a large 12-inch skillet, heat 2 tablespoons olive oil and 2 tablespoons butter over medium heat. Add the mushrooms with a couple pinches of salt and cook for about 5 minutes, until they are tender and release some of their juices. Stir occasionally to make sure they cook evenly. 6. To assemble the lasagna, lightly coat with cooking spray the bottom and sides of a 9X13-inch baking dish. Spread 1/4 cup or so of the white sauce in the bottom of the dish. Arrange a layer of noodles on top (about 3 no-boil noodles for each layer without overlapping them – just laying them next to each other), then more sauce (about 1/4 of what remains), 1/3 of the mushrooms and 1/3 or so cup of the grated cheese. Repeat two more times then top with a final layer of noodles, your remaining sauce and last 1/4 cup of cheese. 7. Bake the lasagna for 45 minutes, or until top is browned and the sauce is bubbly. Remove from oven and let sit, lightly covered for 10-15 minutes before serving.